100. Oh yes, of course I know you all can count. After all, you read this here erudite blog, doncha? My 100 this week is the 100 of the club variety, which sits at the Tottenham Court Road end of Oxford Street like an old man waiting to be knocked down. By all accounts, that is what is going to happen. At the end of this year, the 100 Club, with its bevy of orange plastic chairs and its quite extraordinary toilet facilities, will close its doors and, in doing so, will lock shut seven decades of musical history. That’s it. Gone. My first visit there was in the Christmas of 1990, on a Tuesday lunchtime, when my Dad was recording Jazz Score for Radio 2, and the club was decked with reassuringly childish paper decorations and tinsel glitterballs that had clearly been in annual use since 1975. I remember seeing George Melly arriving at about 12.30pm weaving around the tables in a bright blue trilby, although I didn’t know who he was. At lunchtime, the club smelt of a mixture of weak ‘Pledge’ polish, instant coffee and last night’s Silk Cut King Sizes. There used to be a servery towards the toilets that served teas and coffees at lunchtimes in curious white, institutional cups and saucers, and free entry (or £3) to jazz trios and quartets was a regular occurrence. Over the next decade I learned how not to be sick from alcohol, how not to have an affair, how not to travel to Suffolk, how not to jive, how not to give up smoking and how to avoid your ex boyfriend’s ex girlfriend in the toilets. I did it all in the 100 Club. If there is one word that sums up the essence of 100 Club-ness that is the 100 Club, it is “smear”. The tables were always a bit smeary. The lino floors were always slightly sticky underfoot, and the stairs from the back of the club to the Mews behind Newman Street were lain with old, greying lino. When I was fifteen (watching “The Big Town Playboys” I think) me and two friends sidled up to the bar, thinking we were dead cool, and ordered three Malibu and lemonades. The barmaid, a girlfriend of my brother’s at the time, later said that when it came to the Malibu she had to “blow the dust off the bottle”. That’s the kind of place it is. If you didn’t want to listen to the music, you wouldn’t actually want to go there for the cocktails. Although I particularly like the bunking-off atmosphere that was present at lunchtimes, the atmosphere on full nights were some of the best I have ever known. 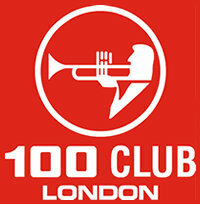 It hasn’t escaped my attention that the 100 Club seems determined to go out with a whimper rather than a bang. The current owner has not been vocal about bowing out, and has not issued a rallying cry for support. And the Horton’s – Roger and then his son, Jeff – have owned the venue since 1964. This is singular. Although trying to raise £500,000 worth of capital in six weeks is a daunting task for the most sanguine of business owners, the fund at http://www.savethe100club.co.uk/ is created by musicians, not the club management. If the amount of emotional investment people have in the 100 club has blinded them to the financial impossibility of this fundraising, the same thing hasn’t seemed to happen to the club owners. Nevertheless, the campaign is moving ahead swiftly, and I urge everyone to pledge whatever they can, because if they open another Starbucks on that site, filled with boiling hot coffee (wrong! Ask an Italian) with no crema, and coffee that is served in big cups (Wrong! Ask an Italian) with one third foam and the other two third gnats piss (Wrong! Ask an Italian) I will personally drive down to No 100 Oxford Street and ram my car into it. I don’t need to tell you about the 100 Club’s contribution to music in Britain. A simple Google search will do that, but what is particularly sad about this closure is that it comes so hot on the heels of the demise of the Astoria at the junction of Charing Cross Road and Tottenham Court Road. Although I am not one of those oafs who think that music venues are more authentic if they are sweaty and smell unpleasant, I think the Supper Club revival doesn’t speak to the under-30s, and one of the strengths of the 100 Club is that it is as faithful to it’s Monday night jive classes (where you are likely to bump into the only kind of people in the West End who are dancing with sandals on in mid-February) as it is to it’s Friday night neo-punk gigs promoting young talent. And – let’s face it – on a weekend evening in England it’s either that or the X Factor. And although regular readers will realise that emotional entanglement with the many Londons of the past is something the Bluebird often indulges in, that is not the case here. I actually don’t think the 100 Club should have to become something else in order to survive, as it ought to be allowed to survive on its merits. That’s what City Mayors are for; and that is why pressure on municipal bodies will work if you harangue them enough. Personally, I would pay good money to see Boris Johnson dancing to R&B on a Thursday night in the 100 Club, but only in the interests of mockery. However, realistically, I cannot see it surviving without becoming something else. It is too cheap a night out in the West End to be sustainable in a 2010 of obscene business rates and rising rents. It is too casual; one of its merits being that popping in on any given night of the week and putting down £10 / £12 on the door is a civilized way to operate socially. It’s what cities are for; you go out in the evening and you are presented with a choice which is dependent on mood. The necessity of having to pre-book our entire lives feels antiseptic and few people want to live that way. But, if it can’t survive in its current offhand and basic manner, better it folds quietly than reappears in an altogether ignoble existence at a later date. You know what I mean, thick white tablecloths, squirmingly embarrassed young staff leaning hands clasped behind backs to take you order of roast duck, undignified door staff in knock-off Paul Smith demanding £40 a pop for supper club dinner jazz. Oh no, no, no, no, no. If the club does survive – and it’s a huge if – here’s hoping it is able to retain something of its former self, and not shrug it off entirely. I very, very much hope that happens. But I doubt that it shall. And the closure of the Astoria, which I mentioned earlier, had little to do incidentally with suffering in the current economic climate. It was part of a compulsory buy-out scheme due to the Crossrail development which has farked up the entire Tottenham Court Road / Charing Cross Road area for pedestrians for the last year. They simply swept it away. Imagine the indignity of surviving quite competently for decades, only to be demolished because of a fast track train to Southend that no one wants. Let’s hope the Save the 100 Club campaign gets on track just as quickly, before time runs out and the 100 Club train leaves the station. Thanks Dave – as for the Suffolk question – its a long story!! Not only would talking to Bill Colyer about John Steinbeck not go down well in Starbucks, but I don’t imagine Ray singing “A Pizza You” would go down all that well in Starbucks either. Oh well, here’s hoping for a last-minte reprieve for the 100….